Barely more than 100 km apart as the crow flies, on either side of the southern Carpathians in Romania lie two historical buildings, each of them famous in its own right. And there is a strong connection between the two: both are inspired by a folk tale of a walled-up woman. The Fortress of Déva/Deva (pictured above) is first mentioned in a royal grant from 1269 and – situated on a hill overlooking the city of Déva itself – is the hallmark of the entire region. 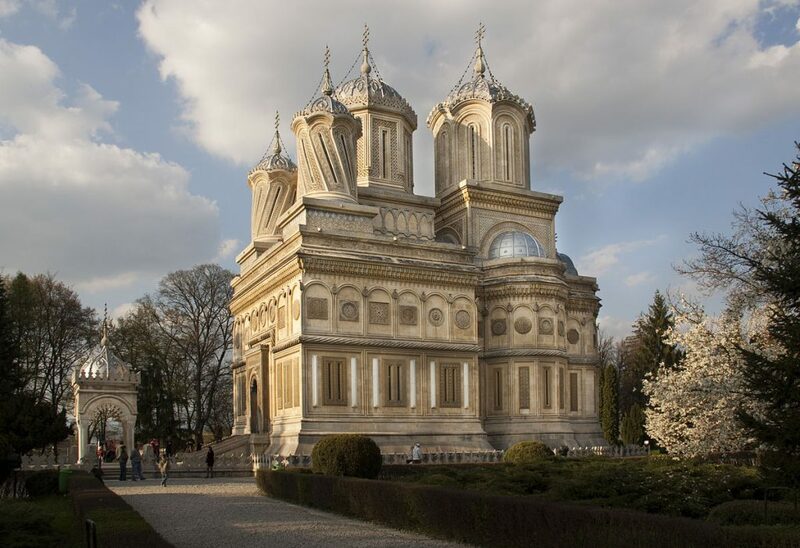 The Curtea de Argeș Romanian Orthodox Cathedral was built at the beginning of the 16th century in Byzantine style with Moorish arabesque accents. A Hungarian folk ballad dating back to the 16th century has one Kőműves Kelemen (Clement the Mason) as the central character, who – together with his band of 11 masons – finds himself unable to complete the Déva fortress because whatever they accomplish in the course of a day will have crumbled by next morning. Believing themselves to be cursed, they agree that they will murder the first wife who visits, burn her corpse, and mix her ashes into the whitewash of the building. It is Kelemen’s wife who visits first. Kelemen returns home to his son and tells him what he did. The boy then visits the fortress and dies of grief. At the Orthodox Cathedral, we find Meșterul Manole (Master Manole) and his team of bricklayers, in this case nine of them, in the same bind. This time, it’s made somewhat more urgent by the fact that Prince Radu the Black, who commissioned the church, threatens to execute the whole lot unless they complete their work. They come to much the same agreement as Kelemen’s crew, and it is of course Manole’s wife who arrives first. In the Romanian ballad she also has a name, Ana, and she’s pregnant. The end of this ballad is similarly tragic: the prince finds the church to be uniquely beautiful and to prevent the team from building another one, he strands them on the roof. They all try to fashion wings from the shingles and fly down but fail. The ballad also mentions a spring that originates from the place where Manole fell. Is there a moral here? Maybe. Regardless of their differences, Hungarians and Romanians seem to subscribe to the same idea metaphorically formulated in the ballad: no great work of art can be accomplished without an equally great sacrifice from the artist.